The moisture level of your cannabis while being stored will have a noticeable impact on the quality of your buds. This is particularly true for some medical marijuana patients, who often purchase in bulk and must therefore must store their cannabis for quite some time before consumption. If the environment surrounding your cannabis is overly moist, the texture of the buds will be affected and they will lose their vibrancy of color, not to mention the dreaded possibility of mold forming. Similar issues arise when marijuana becomes too dry during storage. The color of the herbs is impacted, and the dryness can result in crystal-laden trichomes becoming detached from the bud and falling to the bottom of your container. 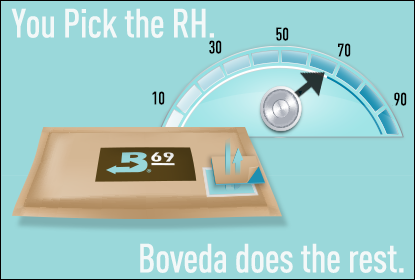 In order to ensure that your cannabis does not suffer any of the aforementioned fates, you can use a Boveda humidity pack to maintain an optimal, consistent temperature at all times. A range of different humidity percentages are available, but research has confirmed that RH 59% – 63% is the ideal relative humidity range for marijuana.